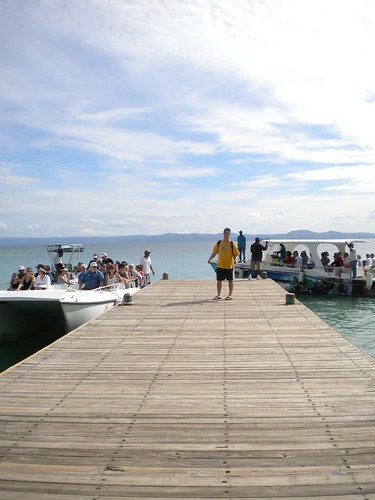 The hubs in San Juan, Puerto Rice (which is a gorgeous place)! I often took walks around the track on the top floor. What a view. I miss this. 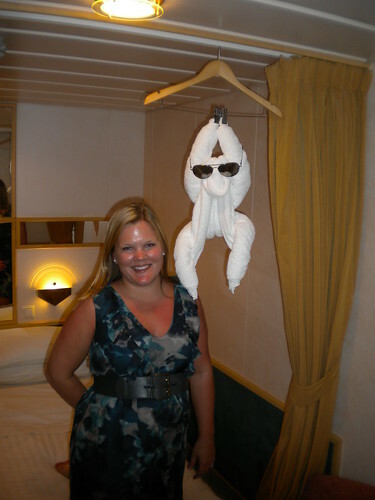 Our favorite towel animal of the week! I can't find the picture that includes the boys. I think it's on John's camera. We actually shared a dinner table with this crew and we had a blast. We originally requested a table for two to be all romantic and shiz, but we were placed at a table for six. We are so glad that we were. The couples at our table were hysterical and we ended up hanging out most days/nights. Anyways, the cruise line we ended up taking was Royal Caribbean (someone asked) and overall we had a great time. There was one small problem (if you notice the seabands)-- we did NOT have fabulous "sea states" for a few days during our trip. The second day on the ship we were sailing through North Carolina and Florida and the seas were pretty rough-- 8-13 ft waves. I felt pretty nauseous which is rare for me. I can ride a roller coaster fifty times, so I wasn't expecting to have a problem on the ship. Thankfully, the seabands saved me and I didn't puke. On the way back towards Baltimore while sailing through North Carolina we hit a really rough spot-- that lasted 24 hours. I'm talking 45 foot waves. At one point, we all thought that we were dying. We were at the restaurant up at the top of the ship and we hit a wave. I'm pretty sure that the ship fell over at a 45 degree angle and I thought that we were goners. It was tsunami part 2. People fell out of their seats, all of the food fell to the floor, liquor and wine bottles flew off of the shelves, and a trash can skidded across the floor straight at me. It was the scariest five minutes of my life. Thankfully, we survived (obvs), but it was scary. People were hurt, 1,000 dishes were ruined and thousands of dollars of wine/liquor was destroyed. The captain said that it was the worst he's ever seen in over 12 years. People that used to be in the navy/coast guard claimed that they had never even lived through something like that before. 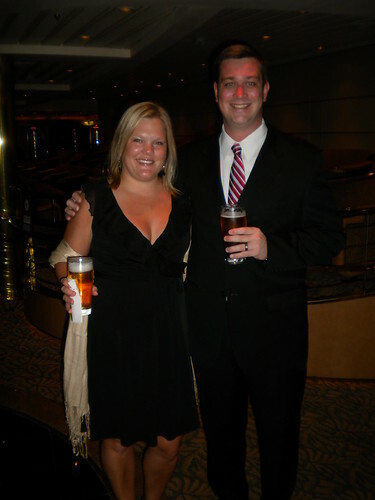 Thankfully, the hubs wasn't bothered one bit which is great because...... that means more cruises! He loved it and it was his first. Amazingly, the day that we have 45 ft swells, I didn't have an ounce of seasickness but I was happy to touch land the next day. Now that I'm home, I already sea sick (HA, pun intended) and want to get back on. That's so crazy about the waves! I would have been sick for sure and that sounded really scary! 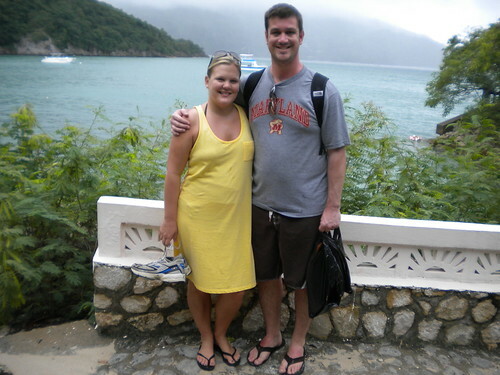 Isn't Labadee beautiful? 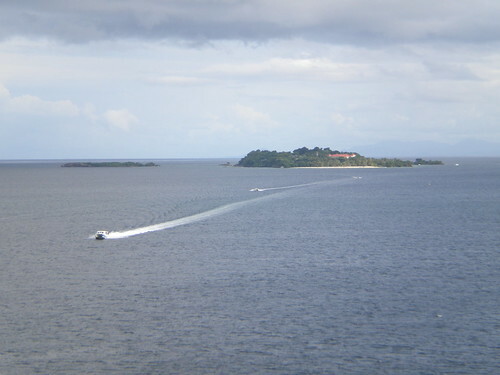 We went there on our RC cruise too and it was really nice. 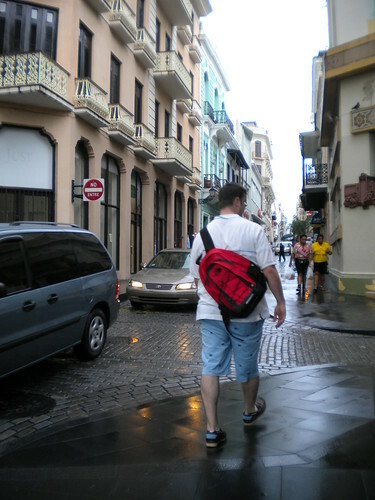 We also did San Juan and St. Maarten. 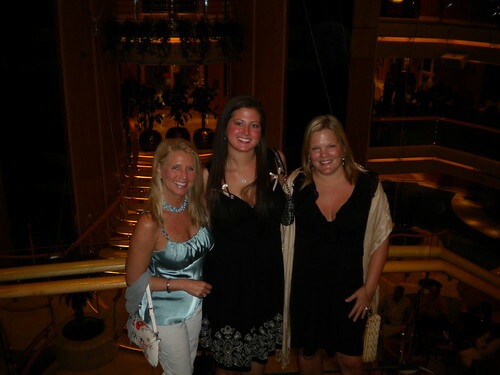 I took a 3 day cruise once and it was one of my favorites and best vacations ever! Cruises are one thing I have no desire to partake in. Wow! Scary!! Hopefully since we're in the Caribbean only it should be smooth sailing. That's just crazy. Did you hear about that Carnival boat recently that had to be "towed" to California and they actually had to have a supply and food drop because electricity went out! 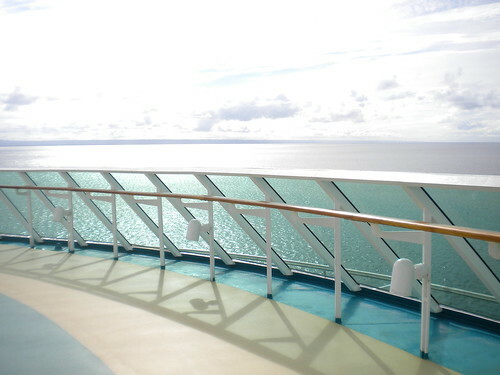 Which Royal Caribbean did you take? I think we took a similar trip- we've been to that place in DR, San Juan, and the other places you mentioned in your first post. Isn't it sad that I've been on so many cruises that I don't know which ones had what itineraries!